On Wednesday 5th March, 8 – 10pm GMT Around Sounds features Bloco Do Sul playing live. In the UK we celebrate the start of Lent with a few soggy pancakes. Over in Brazil, they celebrate it with a week-long party the likes of which the rest of the world can only dream of. Carnival in Rio is renowned for being the best party anywhere, and the rest of Brazil it is just as hard for a week before the main night on Shrove Tuesday. 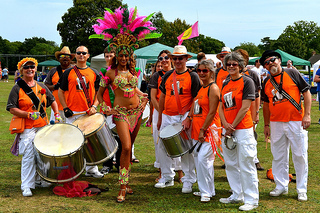 To celebrate this the Around Sounds show on Radio Woking is putting together the ultimate Brazilian Carnival special to try and bring some sunshine to what is bound to be a typical cold, wet British March night. Matt will be bringing you the full range of traditional and modern Brazilian music to try and give listeners a picture of the rich and varied musical palate that makes Brazilian music some of the best in the world. The real highlight of the night is going to be a live performance by one of the UK’s best established ‘Samba Bands’. Bloco Do Sul have been bringing the pulse of the Brazilian bloco to the UK for 25 years and are going to be presenting a full 16 piece contingent to perform in the recently opened Woking Studios. The excellent facilities of the Woking Studios are adjacent to the Radio Woking studios, allowing us the privilege of playing Bloco Do Sul’s performance live on the air and interspersing it with the latest and greatest sounds of Brazil. You don’t have to wear a sequinned g-string to listen! Tudo Bem! Around Sounds is on Radio Woking every Wednesday night between 8 and 10pm.